Thanksgiving Day is just a week away. It is a time to give thanks to our beloved ones and appreciate what we have. In this atmosphere, Digiarty Software prepared special Thanksgiving gift – license keys of its top seller WinX HD Video Converter Deluxe and gives it away unlimitedly over the internet. This thanksgiving giveaway will last till Dec.6th covering two rounds to meet benefit DVD/video lovers. The first round will be valid before Nov.25 and users can free get a copy of WinX HD Video Converter Deluxe to convert/edit videos, download online videos and make photo slideshow with ease. Don’t miss out your chance here: http://www.winxdvd.com/giveaway/. If you are interested in a DVD backup solution, stay tuned on this page and you will get your copy from the second round giveaway. WinX HD Video Converter Deluxe embraces video converting, video editing, You Tube video downloading and photo slideshow creating features in one body. It is able to convert nearly all kinds of videos, such as HD/SD MP4, AVI, FLV, WMV, MOV, MPEG, H264, MKV videos, HD camcorder shot AVCHD, M2TS, MTS videos and Blu-ray videos. 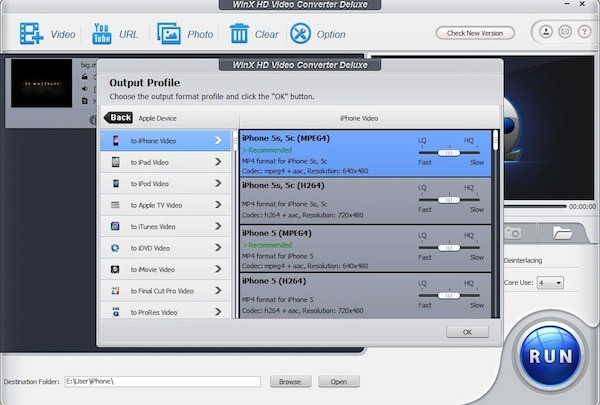 Besides, WinX HD Video Converter Deluxe has also been built with preset profiles which allows users to convert videos to portable devices directly. Just name some of the new gadgets like converting videos to iPhone 5S/5C, iPad Air, iPad mini with Retina, Samsung Galaxy Note 3, New Nexus 7, Kindle Fire HDX, Surface Pro 2, etc. That is to say, users can enjoy any kind of videos whenever they go at any time. So cool! Another interesting feature needs to be mentioned is creating photo slideshow. In this Thanksgiving reunion time, most of us will take lots of memorable photos to record the sweet moment. With WinX HD Video Converter Deluxe, you can make these photos into a slideshow then convert it to a movie-like video. You can upload it to You Tube, send it to your friends via emails, or burn to a DVD disc for safe keeping. PS: If you want to read more about WinX HD Video Converter Deluxe, please go to its official page: http://www.winxdvd.com/hd-video-converter-deluxe/. In addition to the giveaway, Digiarty is also offering Thanksgiving exclusive deals. For example, WinX Thanksgiving Gift Pack $39.95 only (75% off), WinX DVD Ripper Platinum $29.95 (50% off), etc. We sincerely hope you have a happy and prosperous Thanksgiving holiday.